Every now and then you just want something that’s been breaded and fried; fish fingers, chicken nuggets, turkey twizzlers etc. But why stop there? I’ve always said there’s very few things in this world that feel better than arriving at a party in which the spread is totally beige, and I’m always looking to add to the list. 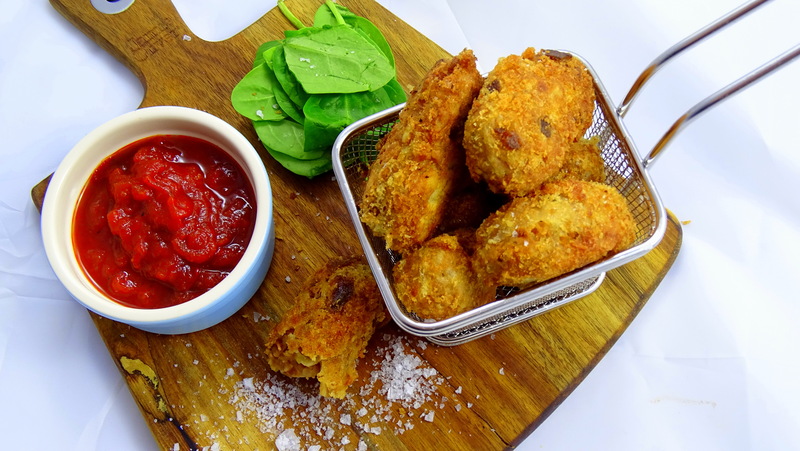 These vegetarian croquettes take inspiration from central America although quite frankly you could try any spice mix. They make a wonderful side dish, starter or canape, especially when dipped in hot salsa or garlic aioli. Beans – I used a tin of 3 bean salad, but any will do. Sweetcorn works too – I even broke up some pieces of baby sweetcorn to use. Spices – I used chili powder, ground cumin and ground coriander. Put the beans, garlic, onion and spices in a bowl and crush with a potato masher. Your mixture might be a bit wet, in which case either add some breadcrumbs to fill it out or strain some of the liquid. Wet your hands a little and shape the mixture into oval shapes roughly 3 inches long. 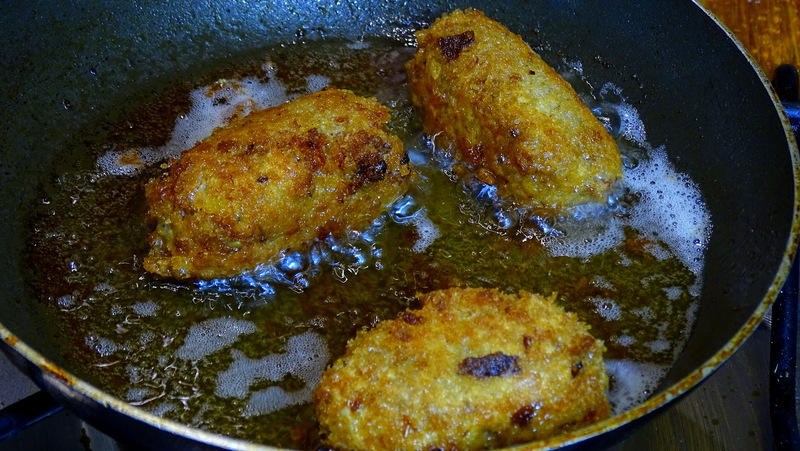 Standard breading procedure – first roll them in flour, then with beaten egg, then roll around in the breadcrumbs. If you have a deep fat fryer feel free to use that. I prefer to save oil and shallow fry. As long as the oil is around 1cm deep this will work. Fry them at a high heat, a few at a time so the oil temperature stays up. When the outside is golden all around remove to some paper towels to drain excess oil. Sprinkle over a little salt and serve! As you can see I went for an offensively small pretentious fryer basket, but by all means use a bowl. A dipping sauce is essential for the full effect! Posted in Guesscipes, Sides and Snacks, Starters, VegetarianTagged bean, bean burger, canape, croquettas, croquettes, food, fried, gourmet, guesscipe, mexican, recipe, side, starter, VegetarianBookmark the permalink.